AMD’s variable refresh rate tech is about to get a lot more accessible. AMD’s stutter-stopping FreeSync display tech no longer requires DisplayPort, thanks to Samsung’s new CF591 and CF390 monitors. FreeSync works with AMD graphics cards to keep the display’s refresh rate in sync with a game’s current framerate. This helps avoid the tearing effect that can occur with fixed refresh rate monitors, without the stuttering induced by V-Sync. Until now, FreeSync has only worked with DisplayPort, which tends to appear on more expensive monitors. (Nvidia’s rival G-Sync technology has the same limitation.) But last December, AMD vowed to open up FreeSync to HDMI, while also bringing the tech to some gaming laptops. Samsung’s CF591 (27-inch) and CF390 (23.5 and 27 inches) monitors are the first to support FreeSync over HDMI. Both are curved 1080p panels, with 4ms response time, 250-nit brightness, 3000:1 contrast ratio, and an 1800 mm radius of curvature that's much tighter than Samsung’s previous efforts. The CF591 also has built-in 5-watt speakers, a slicker silver-and-white design, and DisplayPort 1.2, while the CF390 is HDMI and D-Sub only. 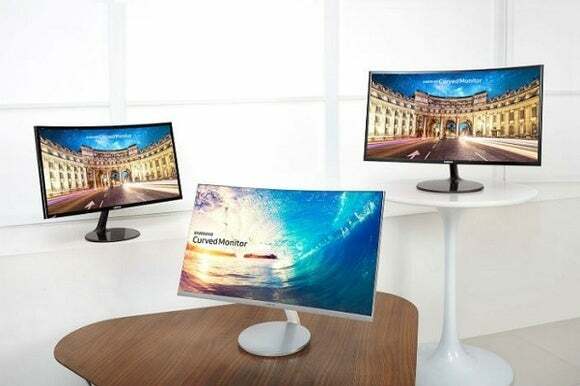 Samsung hasn’t yet said how much these monitors will cost, but plans to launch them this month in the United States, Europe, and Asia. FreeSync requires an AMD graphics card that supports the technology, and the new HDMI support should work just fine with existing FreeSync-compatible cards. Acer and LG also have FreeSync-over-HDMI displays in the works. Why this matters: Freesync monitors were already less expensive than their G-Sync counterparts, as they don’t require any special hardware modules like Nvidia’s tech does. With HDMI support, FreeSync should start heading to even cheaper monitors, making the elimination of stuttering and tearing a bit more accessible—at least for AMD graphics card owners.